The Scuba Expert Let's Get Wet: Carotid - Sinus Reflex Is this Harmful to Me as a Diver ? Is this Harmful to Me as a Diver ? How many of you as divers wear tight hoods, or extra tight wet suits, or even tight necks on your dry suit ? If so, have you ever came out of a dive not feeling quite right ? Did you get light headed, or dizzy as a result of it ? I have the answer to why this has happened ? It is called Carotid-Sinus Reflex. Let's review, as you may know the carotids are the large arteries that run from your heart up the middle part of the neck to the brain. In fact, these arteries are the major arteries to supply blood, nutrients, and oxygen to the brain. You might remember these as the ones that you check while doing CPR. Oh yea. Thats right. Normally you will sense a pulse while checking during CPR. Now on to what this reflex is all about. 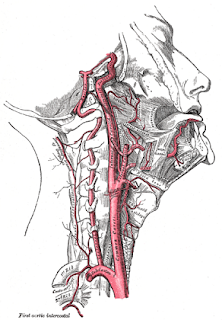 Carotid Sinus receptors monitor blood pressure within these carotid arteries and send impulses to the cardioinhibitory center within the brain to regulate the heart. So if these sensors senses high blood pressure, it stimulates this center in the brain to slow down the heart. At least till the blood pressure comes down. On the other hand, if these carotid receptors detect low blood pressure, it stops stimulating the cardioinjibitory center, which now in turn stops sending signals to the heart. The heart rate in this case increases. Now, if a diver wears an excessively tight hood, neck in the wet suit or dry suit that constricts the neck, the carotid sinus receptors incorrectly interprets the excess local pressure as high blood pressure. Which then stimulates the cardioinhibitory center and then slows the heart in responses to it. This slow heart rate slows blood flow to the brain. If the pressure on the neck and receptors continues, causes an even greater high blood pressure, and a continued slow blood flow to the brain. Eventually, a diver may lose consciousness due to the reduced blood supply reaching the brain. In most cases, a diver feels discomfort and light-headedness before the constriction leads to a serious problem. Remember to visit my link sponsers for valuable free stuff for your home business. Thank you for being a valuable listener to my program. Buddy System - What Are The Benefits ? Why is A Burst Disk Important ?